The Quilted Fish in Algoma, Wisconsin, is a Quilt Shop selling the newest fabric and notions as well as 108″ wide backings and batting They also carry several gifts items, calendars, cards etc…All about Quilting! . We offer Classes for children, and adults. 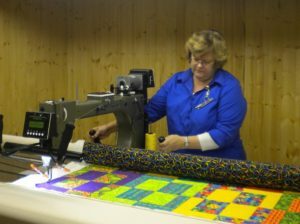 Mary has been quilting with a Gammill Classic Plus for customers using Pantographs for 12 years. She can also make T-Shirt Quilts for people using their favorite T-shirts! “We keep you in stitches.” ? Stop in soon!